Over 26 years in the Hawaiian Islands, Leah has written a book called from Harlem to Maui. Leah has gone from Canada to the South of France attending the Cannes Film Festival in 1995. From the San Francisco Bay area to Jamaica, from the UK to Iceland. In 1989, Leah was personal assistant to the High Priestess of Soul Dr. Nina Simone on a European Tour. Broader than Broadway, Leah has gone from being the star exotic dancer on a Polynesian passion cruise, to a television producer, director, and editor. Leah' poetry is rooted in her experience of life and philosophical lenses. At the age of 8 she began reciting verse at universities. At the time, she attended an innovative private school in San Francisco called the Multicultural Institute. Her mother was a psychologist; Leah's father was a yogi and a landlord. Leah' stepfather was a lawyer and an Orthodox Muslim. Annalamah, Leah's grandmother who lived her whole life in Harlem, was given that name by her father who was a spiritual leader from Calcutta, India. Annalamah is Leah's middle name, given to her at birth. Leah credits these four people as her major influences growing up. The odyssey for Leah began at age 14 where in she won awards in black and white photography. From there Leah attended the American Film Institute in Los Angeles. Leah is a member of the Screen Actor's Guild of America. In her Hollywood days, she worked on over 45 TV shows, films, and commercials such as Star Trek: The Next Generation, A Different World, and Fame just to name a few. 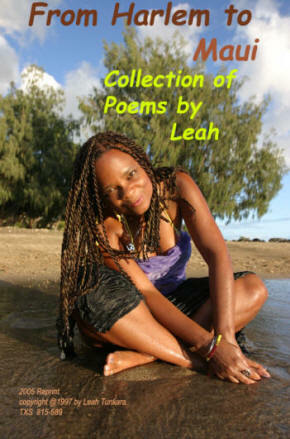 Today Leah's poetry is mostly employed on her television shows such as "Leah's Walk About 6", and some of her over 35 documentaries produced in the Hawaiian Islands.